Founded in 2004, this month marks the 10 year anniversary of marketing, branding and PR firm EMR Media (www.emrmedia.com), and in recognition of that milestone for services to the entertainment industry, Fame Enterprises and the 8th Annual Hollywood FAME Awards has honored Founder Liz Rodriguez with a special commemorative Hollywood Walk of Fame Award bearing the official classic film camera emblem, to support her commitment to the film industry. 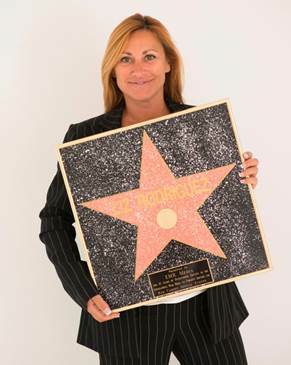 The commemorative award, which was presented privately in Hollywood, was given to EMR Media for ‘10 years’ outstanding service to the international mass media for publicity services and red carpet special events’ in recognition of Liz Rodriguez and her teams’ dedication to the entertainment industry, covering a multitude of international services and specializing in red carpet special events. Established in 2004 by London-born Liz Rodriguez, EMR Media offers pro-active and dynamic marketing, brand and PR strategies for companies and individuals, whether it’s a single press release to industry professionals or a full blown marketing and PR campaign. The company covers a variety of industries including entertainment, publishing, finance and non-profits. Liz Rodriguez has worked, and lived, in major international markets covering a diversity of cultures including; the Middle East (Dubai, Qatar, Abu Dhabi), Europe, South Africa, Thailand, New Zealand, Australia and the USA. Boston Life Magazine ™ Copyright © 2008-2018.